2018 Luxury Grand Hotel Zermatterhof in Zermatt , SWITZERLAND! Bid Per Night and Choose Your Length of Stay! 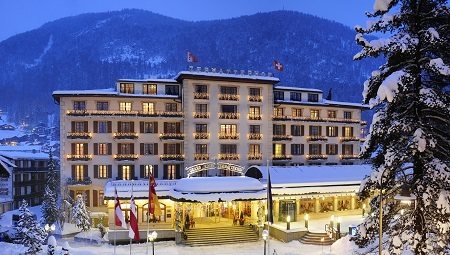 at Grand Hotel Zermatterhof, Zermatt in Switzerland! Boasting an unmatchable blend of historic charm coupled with modern decór, Grand Hotel Zermatterhof is a luxurious hotel in the heart of downtown Zermatt, Switzerland. Just moments away from world-class skiing, vibrant nightlife, and lush garden surroundings, the Swiss resort features exquisite views of the towering mountain Matterhorn in the Alps. Vacationers will delight in the elegant design and sophisticated atmosphere within the front doors of the this five-star hotel. With the fine dining offered at the gourmet on-site restaurants, the relaxing and rejuvenating treatments at the spa, and a variety of hotel activities, guests will enjoy this remarkable Swiss home away from home. 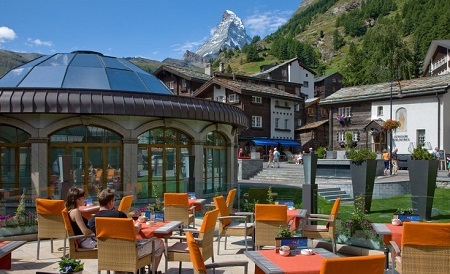 Gourmet dining at this five-star Swiss hotel serves exquisite cuisine in a variety of atmospheres. Between the quality dishes and the restaurant dedicated entirely to fine swiss cheese, guests will delight in the regional flavors. Offer is based on single or double occupancy in a Double Room Classic with 2 Twin Beds and Mountain View. Room with view to the mountains and village, individually furnished, approx. 25m2 /269sqft, 2 single adjoining beds, some interconnecting rooms, some with balcony. Nespresso coffee machine and electric kettle.